More and more laptops are supporting eGPU nowadays. It's even possible to cobble together your own eGPU from under $20 in parts plus the GPU itself. Those who can afford such laptop and external PCIe cabinet most likely can afford and will be willing to get just proper standalone scope. Thunderbolt is just PCIe and I've had machines with those ports for 6ish years now. Laptop and Deskop, Mac & PC. BTW you did "skip" most of my arguments except one, which is not that important actually. Okay. I'll go back and reply a bit more completely. I actually comprehend this pretty well, and I think this is just a point where we have differing opinions. Certainly FPGAs are excellent solutions and suitable for this task, but I think you're imagining the "right" way to design an Oscilloscope and I'm imagining an "unconventional" design that has other benefits. People who believe that an open source 'scope is only worth doing if it surpasses in price or performance what's available commercially, specifically the various Chinese import scopes. Certainly it's hard to come up with a design that beats what already exists in both areas. People who believe that an open source 'scope should be designed to cover the niche roles of a cheap/simple/portable/accessory scope, so it can be (for example) left in a field location to trigger on some very rare event, or used for tasks requiring dedication of a scope where someone would not want to tie up their main or preferred scope for a long time period. People who believe that an open source scope is worth doing simply because of the benefits of having an open hardware design available to everyone. Open Hardware is a concept that is in its infancy compared to open source software, but it's easy to see what benefits it could have if an open source scope project "takes off". The most well known open source software project in the world has gone from being an academic curiosity to being the most used operating system in the world, period. This is an extreme example, but if anything remotely similar to this were to happen for open hardware, the benefits would be obvious. People who value the idea of designing an open hardware 'scope as a challenge for its own sake. I tend to identify with the third point of view. I believe that moving the main functionality of the scope into software would open the potential pool of developers for the project from the few that understand hardware and FPGAs enough to contribute to anyone with some device level programming experience in Linux. The more people who are able to contribute, the better the project will become. Certainly there are altruistic people all over the world, but most people with the skills to design or program something like an Oscilloscope choose their projects the same way most of the people posting in this thread do - based on how useful it would be for them personally. So what I'm imagining isn't a traditional design for this reason. Instead of a dedicated FPGA based scope which requires specialized hardware design knowledge I think it is possible to design what amounts to a digitizer card and add software to achieve the functions of an oscilloscope. If such a thing can be done within the constraints for a DIY project (cost, manufacturability) for a reasonable price and without design compromises turning the project into a toy rather than a tool, that is a much better route to go for an open hardware project because the success of open software and hardware projects depend heavily on popularity. Just like a book, it will have little impact on people who can't read the language in which it is written, so it makes sense to design an open hardware project to appeal to the widest audience possible. Putting the main functions of such a tool in software means that not only can it attract more developers for oscilloscope functionality, but since it can be reprogrammed for many more uses it gains an even wider audience. It could be a high speed digitizer for software defined radio, or a processor for sonar data, or many other things. If it is not technically and economically possible now, I think it will be in the next few years as technology advances. It's even possible to see the day when an external peripheral with a wireless connection will perform all the functions of an oscilloscope, voltmeter, logic analyzer, vector network analyzer, spectrum analyzer, etc. Essentially all these systems in their modern versions read data and provide it to a processor, and software does the rest. Eventually, the hardware will merge into a single device class below a certain performance level simply because it's cheaper to make it that way. All the various functions will be in software. So I think an open hardware project could anticipate this. Thank you for providing deep insight into your reasoning I appreciate that. I agree that PCIe sampler architecture you propose is indeed possible. On the other hand you have only one single strong argument: community that knows PC-programming languages better than VHDL/Verilog. - True. But is it really showstopper? Hi-performance 1Gsps sampler scope is not a kid's toy. Someone shall implement PCIe bus PHY with all the bells and whistles... and not only that. In my opinion/experience PCIe is not that easy task at all. Not to mention PCIe-capable FPGA price. Sample processing and storage is much more simpler task than PCIe PHY. Obviously couple of FPGA guru's needed as core of the project, but I believe - either it is done elegant way or there will be not enough enthusiasts ready to invest their time. >I believe that moving the main functionality of the scope into software would open the potential pool of developers for the project from the few that understand hardware and FPGAs enough to contribute to anyone with some device level programming experience in Linux. Well... huge pool of linux programmers is not enough. They shall be interested in the final product too. > The more people who are able to contribute, the better the project will become. The less people who could actually use product (laptop/minipc owners and those who do not like PC on the desk facing backwards) - the less support it will get. > Certainly there are altruistic people all over the world, but most people with the skills to design or program something like an Oscilloscope choose their projects the same way most of the people posting in this thread do - based on how useful it would be for them personally. Exactly. Personally I vote against PCIe sampler and do not participate. Why? - I have two computers, miniPC and desktop tower PC. None is suitable for PCIe sampler. MiniPC does not have PCIe slots nor Thunderbolt, but dekstop tower PC is standing on the floor too far away for scope leads to reach my table. I am not going to put that huge box on the table facing its back to me just because there is/could_be open source scope PCIe adapter which costs 2x my standalone 1Gsps scope, Sorry. Reality check: does anyone besides erikg want open source PC-based scope which costs more than "made in china" standalone? Please share your opinion. QEX came today with an article about a stand alone 100 MHz BW direct sampling SDR. It uses a Zynq based Zedboard running Linux on a dual core ARM A9 and an AD 9467 eval board. It takes a monitor, keyboard and mouse. This is everything for a single channel open source scope except the scope code. And it's all COTS. So approximately 1/2 a Rigol DS1102E for ~$1000. However, it *is* 16 bit rather than 8. So it's more Keysight and friends territory. Using a desktop PC only makes things harder and more expensive. There is no affordable way to get the BW required. The real virtue of an open source scope is being able to fix bugs and add features. I rather have 8-bit 4 channel 1mV/div to 10V/div 50MHz 1GSPS scope for 400$ than 1-channel 500MSPS 16bit sampler without PGA and who knows when there will be scope software - for 1000$. Or am I missing something here? which describes an early HP implementation of a PC based scope in considerable detail. There's less to a scope than an SDR, but I don't particularly care either way. I've got an Instek MSO in shipment to augment my DS1102E. If someone makes an open source scope that is credible I'll probably get one and write things like VNA routines for it. But I'm not going to design the hardware. At least not any time soon. BTW The Zedboard includes a Xilinx FPGA. The ARM is just to run the user interface and other minor tasks. If someone makes an open source scope that is credible I'll probably get one and write things like VNA routines for it. VNA is closer to SDR than scope. Either it is low cost (more or less toy-) VNA add-on board with PC software for 4-channel <= 100MHz SCPI-capable scopes or it shall be built using SDR approach. How about 25 .. 1500 MHz VNA built out of four RTL2832U+R820T USB tuner dongles (8$ each, delivered)? If you're doing HF design, a 100-200 MHz scope will work just fine. Though, like the RTL-SDR it suffers from the 8 bit limitation. As for using an SDR, that's the main reason I bought an SDRplay RSP2 and a LimeSDR. The RTL-SDR is OK for VHF, but adding 4 downconverters makes it expensive for HF. Buying a VNWA 3E is probably a cheaper option once you take into account directional couplers and the other bits an RTL-SDR setup would need. But the RTL-SDR approach would be fine for someone using the sub GHz ISM bands. There are a slew of VNA projects spawned by the cheap RF chipsets. On the other hand you have only one single strong argument: community that knows PC-programming languages better than VHDL/Verilog. - True. But is it really showstopper? I don't view it as a "showstopper" exactly. Simply put, the more people an open source project appeals to the more likely it is to be successful. You can argue that a software defined scope would be less attractive to EE types like yourself, and that could certainly be true, but the numbers are what matters. The head count of people who know how to program in C or Python is a much bigger number than the head count people who know how to program an FPGA, so if only 1 in 1000 (0.01%) of C/Python people are interested, that's still far more individuals than if 1 in 20 FPGA programmers (5%) are interested. Hi-performance 1Gsps sampler scope is not a kid's toy. Someone shall implement PCIe bus PHY with all the bells and whistles... and not only that. In my opinion/experience PCIe is not that easy task at all. Not to mention PCIe-capable FPGA price. Sample processing and storage is much more simpler task than PCIe PHY. ... in which case only a carrier board needs to be designed with the supporting chips like the ADC and an SODIMM socket for the module. Single unit price on these is more like $250-$300 US, so it's more expensive than a complete DIY, but it's also easier. Probably the best way to go for a digitizing card is to specify hardware capabilities and interface methods for the software and permit multiple hardware implementations anyway Kind of the path that Sigrok takes, being hardware agnostic. That way is even better for a software defined project, because you can completely toss the previous generation of hardware if some great new technology comes out and keep most of your feature set. Yes, but if the project is defined mostly in software then the card will attract developers for applications other than oscilloscopes. As far as the PC facing backwards, it's not all that hard to get extra long probe cables (this is the solution HP used for their mainframe based Oscilloscopes) or a front facing breakout box could be designed to provide front BNC connectors. It's extra cost, of course. Thinking about it, though, it probably makes sense instead of the above to use an external PCIe interface like Thunderbolt-3... it already exists on many systems, has plenty of speed, and if you use USB-C over TB3 you even get power delivery over the cable. The scope digitizer "Card" would be a module in a box connected via thunderbolt to the PC. One small box with BNC connectors and one cable to the PC up to 2 meters long. None is suitable for PCIe sampler. MiniPC does not have PCIe slots nor Thunderbolt, but dekstop tower PC is standing on the floor too far away for scope leads to reach my table. I am not going to put that huge box on the table facing its back to me just because there is/could_be open source scope PCIe adapter which costs 2x my standalone 1Gsps scope, Sorry. So you'd be unwilling to buy a $50 US PCIe card to put in your desktop tower PC to allow use of an external digitizer in a box on your table to which you attach leads, costing something like $400-$500? Maybe you'd need to wait until the price comes down? Opinion gathering is ok, but note that we're not really voting on something here. I'm just writing this to learn about peoples' opinions and thoughts on this subject. If I kick off a development project for a digitizer like this, you can be sure you'll see an announcement from me. Right now I'm really only capable of writing the software for it, though. Still learning hardware. I'm afraid that you overestimate how much job is done in the FPGA of USB scope versus PCIe sampler scope. FPGA just do sampling, trigger, buffer management and interpolation (only samples going to be shown on display). All the measurements of resulting waveform is done by CPU in both cases anyway. Very good example is Infiniium early revision which has very dumb sampler with analog(?) trigger circuit, comparably slow CPU and slow bus between sampler and CPU, yet still it does lot of various signal measurements - obviously using CPU. Very good example is Infiniium early revision which has very dumb sampler with analog(?) trigger circuit, comparably slow CPU and slow bus between sampler and CPU, yet still it does lot of various signal measurements - obviously using CPU. That thread is an interesting read, but it's not really comparable to what we're talking about. That's partly because that hardware is so incredibly old, but the important difference is the location of the sample buffer. Essentially those Infinium scopes are PCs in the same box as a scope board, not a PC with a scope card. If you took the internals of a stand alone DSO and found a way to interface them to a PC so it could be the UI, those scopes are what you would have. 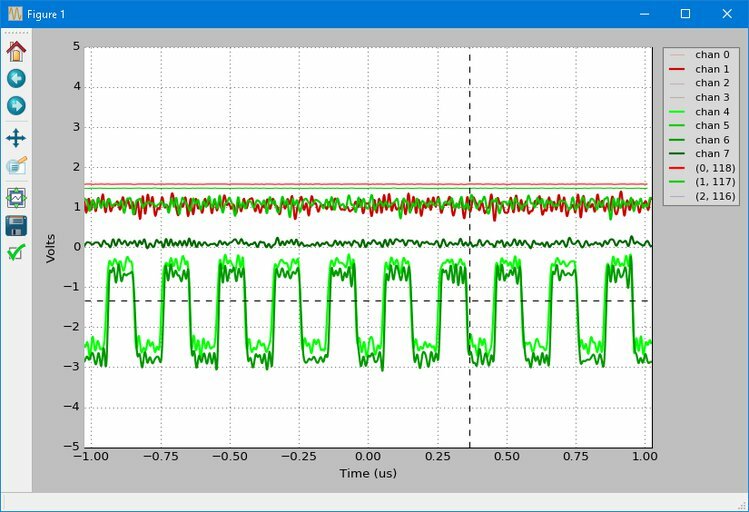 By way of contrast, I've been talking about using modern components and a fast bus to add high speed data acquisition to a PC in such a way that it can be programmed to function as an Oscilloscope, with the sample buffer in main memory. Ideally, the only components on the card would be those needed to acquire the data and get it into main memory. > That thread is an interesting read, but it's not really comparable to what we're talking about. It is. - As an example that hi-end 5GSPS scope do not need direct to RAM sampling to do it's job very well. But whatever. You don't listen anyway so I am wrapping up this conversation. I noticed. You have strong opinion about how to build hi-speed electronics but seems, do not have any experience in the field. So be it. Good luck building you sampler! Well, there's a big difference between not listening and not agreeing, and we just don't agree. I don't have any intention at this point of building this thing, as I've said repeatedly the whole thing is just a design exercise for me. Who knows though, maybe sometime I will. FYI, the Haasoscope project is now live! I've really put some effort into it, and the specs have improved significantly. Hopefully you will meet your goal. I would like to see how test signals look not only on your scope but compared to at least one worthy competitor from Comparison Table, on both 5V and 500mV ranges. Especially want to see claimed bandwidth. Would be nice to see noise floor measurements - existing waveforms looks kinda noisy. 20 Hz looks pretty fast on the screen - that's 20 _frames_ per second. It's hard to see more than that! However, for higher-speed data collection, I do offer a plug on FT232H board, which is supported by the firmware/software, and offers ~30x more bandwidth for the serial connection, and up to full USB2 speed (480MB/s) if someone writes a C++ interface using the FTDI drivers (wouldn't be too hard to do something simple). I invested time in reducing noise last month - it's much better now - just about 1-2 mV in either range! I've moved to a 4-layer board with a full ground plane, and better dc offset control mechanism (DAC vs. PWM). 20 Hz looks pretty fast on the screen - that's 20 _frames_ per second. It's hard to see more than that! Well.. Even for movies 20Hz is not enough When you are trying to catch various irregularities of the signal - then you need to get on the screen as many waveforms per second as possible, preferably intensity-graded way. The more - the better. You want to minimize blind time of the scope to maximize your chances of seeing something that does not happen too often. There also was some oscilloscope review by Dave where he was measuring, comparing and commenting update rate of some scopes. Unfortunately I struggle to find it at the moment. Good news then! Why don't you put it on the board? After all it is "just" ~3.1$/piece @100qty. I invested time in reducing noise last month - it's much better now - just about 1-2 mV in either range! One more reason to show "side by side" comparison of the same test signal to some competitor scope, like Rigol DS1104Z. The bandwidth is as claimed. I've tested with an Agilent 80 MHz signal generator and see almost no degradation until 60 MHz. The 80 MHz sin wave is still very viewable in the 250 MS/s (2 channel) mode. Good. Then you shall demonstrate it too - so potential buyers see true performance of this thing. I wonder if anyone from the forum was involved. Ah, I agree that "blurry super fast update" mode is cool. I'll have to work on that. I think it's fair to say that's rarely available for $99 though. With the USB2 output it should be doable. Get one and test it out for me! OR maybe Dave can review?! Indeed. On the other hand, hopefully you are not building "just yet another low cost scope", right? Having some unique feature will add to the value of your product. As for bandwidth, I do have that shot in the video of scrolling up to 40 MHz in the FFT plot. You can see the amplitude is unchanged up to 40 MHz at least. Well... at least amplitude does not steadily go down However to be honest - does not look smooth to me at all. Amplitude jumps around and what's worse - bounds of vertical scale too. Can't you make it fixed? Maybe you can make separate video just with smooth and slow sweep 0..60MHz during 1minute as (IMHO) elegant demonstration of bandwidth and FFT function? As a person learning hardware engineering from a software engineering background i can confirm that the prospect of an open source, PC based scope is exactly what i want. I would be willing to pay much more for it than a proprietary device of a similar specification as it would both allow me to operate natively in an environment that i am accustomed to and to deploy any modifications to the functionality of the scope with a few commands. I have an idea to design new main board for Keysight 1000 x-series scope, to make it 800MHz bandwidth. It have ADC, FPGA and processor on separated board, so I will be much easier then design all oscilloscope hardware and software for processor and FGPA. Do you have some schematics, application notes, literature and other resources, which can be helpful? I want to base on http://www.ti.com/lit/ug/tiduba4/tiduba4.pdf and on photos from Dave teardown - https://www.flickr.com/photos/eevblog/albums/72157657671196148 . I have complete schematic of Keysight main board from reverse engineering.